It’s a busy fin de semana. 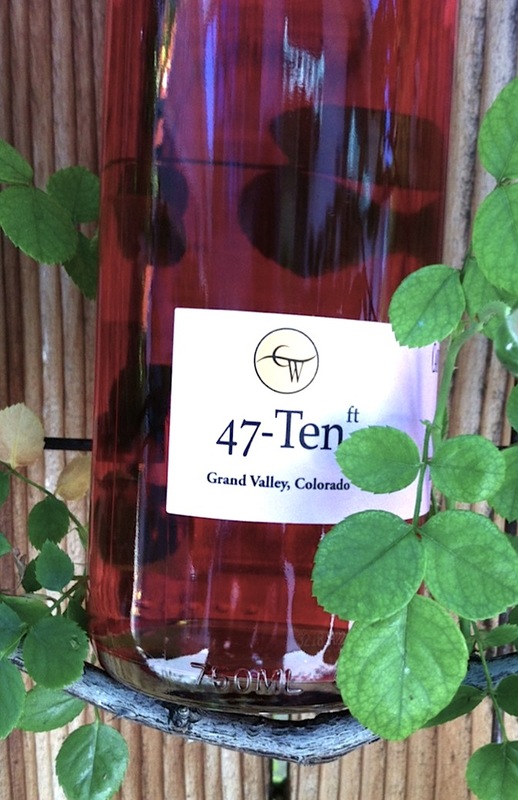 The 47-Ten 2012 Grand Valley Rosé is part of the 47-Ten line of wines produced by Canyon Wind Cellars in Palisade. The 2012 vintage was perfect, said winemaker Jay Christianson. I’m on the road Thursday through Saturday, headed to Gunnison for a meeting and then on to Denver on Friday for the Governor’s Cup Awards Presentation on Friday night and the Colorado Urban Winefest (presented by Westminster Total Beverage) on Saturday, all part of the 2013 Colorado Wine Week. Yay, to drink great Colorado wine and hobnob with the, well, hobnobbers. But first, the important things, like Day 4 of the Colorado Wine Week Challenge. You remember? Opening and sharing (that’s very important) a different Colorado wine everyday. Or night. Or day and night, if you wish. Tonight’s wine (it’s 9:30 p.m., y’all, I just got home) is something special in a different way. It’s the 47-10 Grand Valley Rosé, a 100-percent merlot, tinted luscious deep-pink/salmon rose with a hint of oranges and strawberries on the nose and plenty of strawberries, citrus and acidity in the mouth. 47-Ten is the, well, maybe you could call it part of the “entry level” line of wines from Canyon Wind Cellars in Palisade, which also makes the Canyon Wind Cellars Varietal Series of wines (a bit more pricey) as well as the CWC Reserve and Dessert wines. 47-Ten refers to the elevation (4,710 feet) of the Canyon Wind Cellars vineyard from which this merlot came. I was lucky enough to bump into co-winemaker and co-owner Jay Christianson (his amazing wife Jennifer shares both duties) and he said the 2012 vintage was superb. “It was a great vintage for us,” he said. “We picked this off our older merlot vines and did something different this time. Then the other half was picked, crushed, destemmed, and added to the first half. Which means it’s also really dry, which makes it special because it’s tasty, affordable and one of only two (that I know of) dry rosés produced in the Grand Valley. I agree, but only if they match the quality of the 47-Ten Rosé. The 47-Ten Rose is $12.95 SRP and $11.01 to Canyon Wine Cellars wine club members. It’s time for a change, but is it spring or another blast of winter?